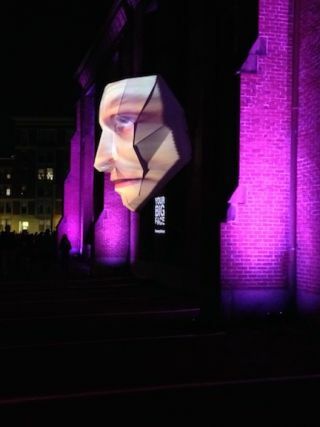 Christie was the presenting sponsor of the acclaimed Illuminus: Nuit Blanche festival in Boston, a free nighttime festival that took place on Saturday, October 25 that transformed the historic and artsy SoWa district neighborhood into a vibrant urban canvas. Offering a unique opportunity for regional artists, designers, creative technologists, architects, performers and fabricators to showcase “their most thoughtful, innovative, and imaginative works,” Illuminus lit up Harrison Avenue with large scale projection displays. Christie’s Creative Services also spearheaded the content production for some of the experiences throughout the evening. 10K-M projectors. The company also contributed by delivering impactful visual experiences based on the work of two artists from Converse's "Blank Canvas" series - Caleb Neelon and Kenji Nakayama. Grantz, who also co-produced New York’s versions of the event in the arts-driven SoHo area of Manhattan, called Christie’s Senior Director of Experience Strategy and Creative Services Denys Lavigne, Illuminus: Nuit Blanche’s “patron saint.” Lavigne’s Global Professional Services group provided the equipment, services and digital content. Lavigne noted that, with the recent announcements at ShowEast with Christie’s 360 degree digital delivery capabilities the company is accomplishing something unique in its approach to multimedia network operations in the industry.